Lab Tested by a nano testing facility. CBD is a naturally occurring compound in the hemp plant. It is a potent and non-psychotomimetic phytocannabinoid that has recently been discovered to have therapeutic effects over a broad range of neuropsychiatric disorders. Gummies may be a favorite snack for children but it could be great for adults too when infused with CBD. You may not have heard about the goodness of CBD but its awareness in the medical circle increases by the day, due to its ability to bring relief to a wide range of symptoms, conditions and diseases with no side effects and risk of addiction. 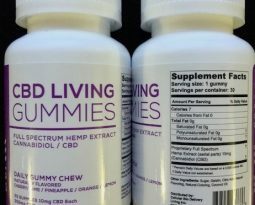 Living CBD Gummies uses nanotechnology just like they did with their famous CBD-infused water. This proprietary process reduces each CBD particle down to one millionth of their original size, allowing these nutrients to penetrate the blood-brain barrier and be absorbed directly into the cells of the body. This makes the bio-availability of the infused nutrients and vitamins 100 percent. The process is described by the “amplified effect”, which means up to 10 times of the cannabinoids, terpenes, and vitamins are ingested. Ingredients: Sugar, Gelatin, Citric Acid, Natural Flavoring, Natural Coloring, Coconut Oil, Full Spectrum Nano CBD. 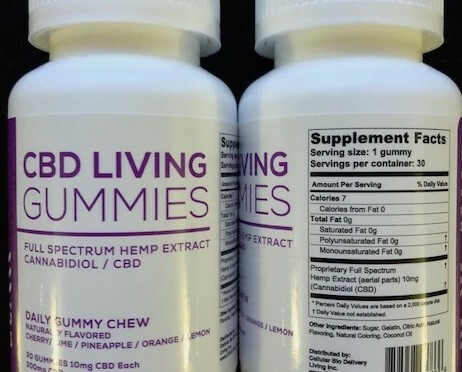 ***CBD Living Gummies are free of Yeast, Wheat, Gluten, Dairy, Eggs, or Peanuts. No Artificial flavors or Preservatives. These things not only taste great but worked wonders for my sore back! Start to work fastly! great!! !